TET (Blue Hippo x Dove In Flight) Ev. EM Re. 6 ¼" flowers, 32" scapes, 4 way branching with 32 buds. Every day, CATCH YOUR BREATH does just that. 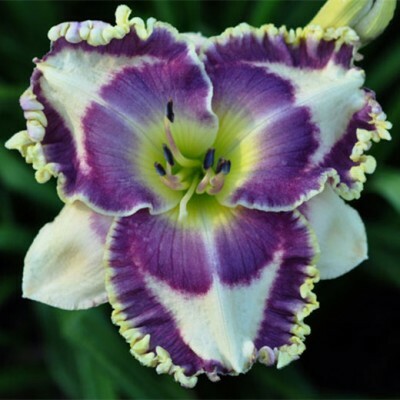 Its background is so clean, close to white, with a deep violet purple eye and a double edge of violet purple and gold, its tremendous green throat finishes the flower! Fantastic rebloomer! Nicely fertile both ways.